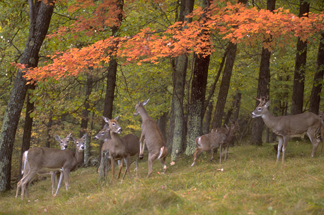 A Buck with a Family Group ( Dominique Braud ). Thanks to Dominique Braud for the use of his incredible photos. 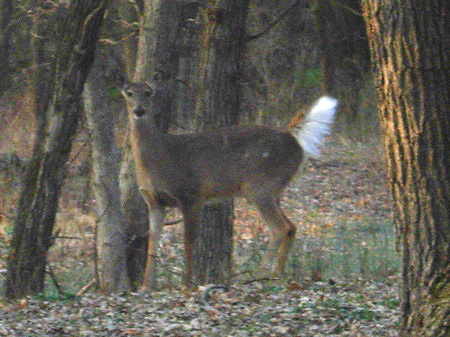 Download the White-tailed Deer Activity form. Answer the questions using the text below. Click here for the PDF. Fawns are born in late May and early June in the Twin Cities. 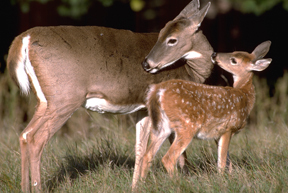 A mother doe will have 1-3 fawns depending upon how much forage is available. Fawns have a beautiful reddish coat with white spots. 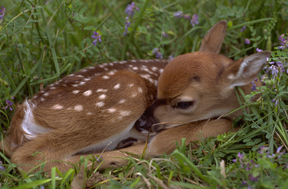 During the first few weeks of life, the newborn fawn will remain close to its birth place. The doe will leave the fawn on the forest floor for several hours at a time. The fawn’s coloration helps protect it from predators like coyote and fox. Fawns are also odor-free which also gives them protection from predators. Most of the fawn’s first month is spent sleeping and feeding on mother’s milk. A fawn is capable of walking at birth, but most of the fawn’s first month is spent sleeping and feeding on mother’s milk. The milk is rich in butterfat, over 12 % (cow’s milk is only 5%), helping the fawn grow from a birth weight of 6 pounds to 60 pounds in just six months. The reddish coat and spots disappear after the first molt, at five months of age. If the fawn is a female, it will stay with its mother for over two years. If the fawn is a male it will stay with the mother only one year. After the first month, the fawn travels with the mother to areas that have good food and cover. In the fall, the fawn and mother joins a doe group and remains with them throughout the winter. In the spring, the fawn becomes a yearling. By summer it feeds alone, but remains close to its mother. Does stay together in a family group most of their lives, usually covering three generations (grandmother, mother and young). Bucks join groups of three to five males after their yearling season. However, in the fall, bucks become solitary and create territories which they defend, keeping other males out and trying to entice females in. 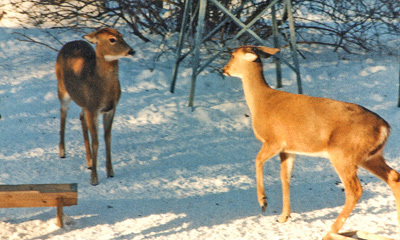 The least aggressive way that a dominant (boss) deer communicates to another is by dropping its ears and staring at the other deer. If the stare has no effect on the other deer, then it may jab at the deer with its foreleg (foreleg kick). The next level of aggressive action is called “flailing”. In this case, the deer rises up on its hind legs and slashes at the other deer with its forelegs. This can be a very aggressive interaction that can hurt the other animal. 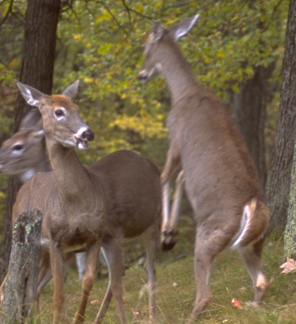 Fights usually occur over territories and not females. 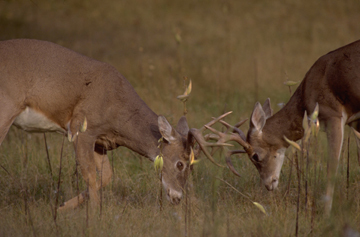 Before a fight, the bucks try to stare each other down, while circling each other with the hair raised on their backs. Most fights last one to five minutes. There is usually an initial charge and the bucks push against each other. If one deer is being pushed around, it will usually run off. A buck losing its velvet (Dominique Braud). In September, at the beginning of the rutting (mating) season, a buck rubs against a small tree to remove the velvet (hair-like skin) from its antlers. 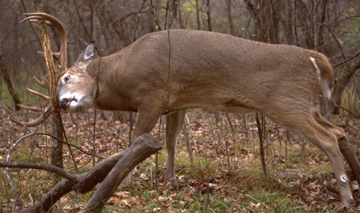 A buck will rub off bark from a tree to warn other deer that he has established a territory in the area. A buck marking its territory by rubbing the velvet off its antlers (Dominique Braud). 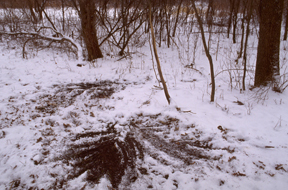 Another way that a buck will mark its territory is by making a scrape. The purpose of a scrape is to advertise the buck’s presence. Most scrapes are made by the biggest, most dominant bucks. 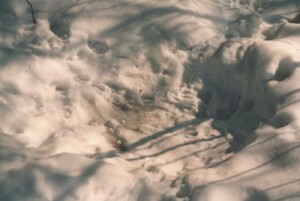 A scrape is about 3 feet wide and is made by the buck pawing with its front hoof. 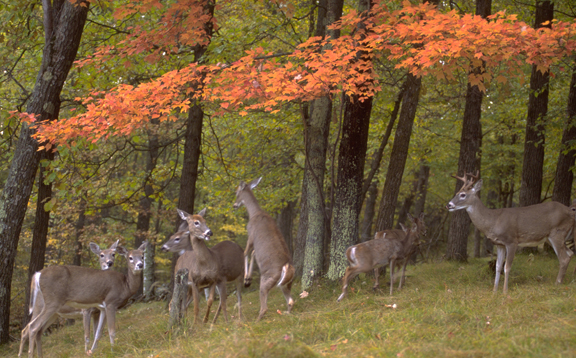 Flagging is an alarm signal to other deer in the herd, telling the herd that danger is near. 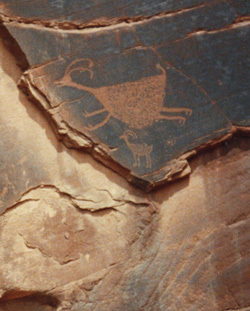 The white tail of the deer goes up and the deer bounds off. 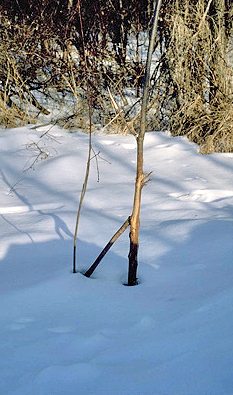 Before a deer flags, it may warn others in the herd by stamping the ground with its foreleg. Growing antlers still in “velvet”. The antlers are grown and shed each year. 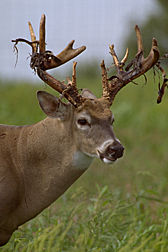 In late spring, the buck’s antlers begin to grow. 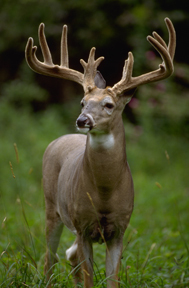 The antlers of a healthy buck can grow as much as 1/2 inch per day. The antlers are covered by a thin layer of skin called “velvet” which is hair-like, short and fuzzy. Under the velvet are thousands of tiny blood vessels. High levels of calcium in the blood helps the antlers grow. Also, during the breeding season, the neck swells to almost twice its normal size. 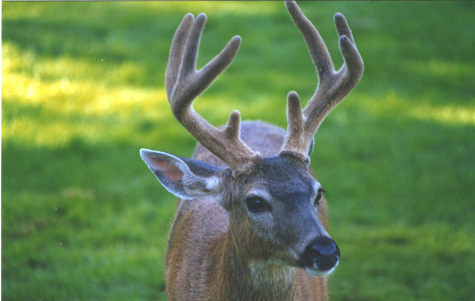 The size of the antlers depends upon the age and food available to the deer. In areas where there is very little browse (food) available, the antlers remain small even if the buck is an adult. In January and February, the antlers begin to drop off (ordinarily just one at a time). Antlers have been called “nature’s drug store”, since they are rich in vitamins and minerals. After falling on the forest floor, antlers are quickly chewed up by mice, squirrels, fox, and other animals of the forest. 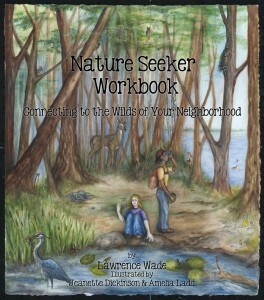 A tracker uses the signs of deer to learn more about them. Deer bed down in the evening and remain there most of the day. Deer will not bed in windy areas because they need to conserve their body heat in the winter. Most deer beds are found in areas protected from the wind, and on south-facing hillsides. South-facing hills are warmed by the sun sooner on cold wintry days and allow deer to conserve body heat. A deer actually walks on its hoof which are the toe nails of two toes. 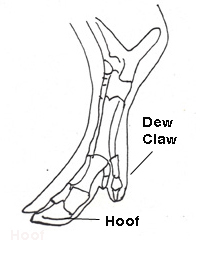 The other two toes are called dew claws and are positioned a few inches above the ground. Dew claws help slow a deer if it is sliding down a hill. The unique shape of the foot allows a deer to run up to 30 miles/hour in short bursts. Deer are also capable of jumping eight feet high from a standing position. Deer are herbivores, meaning that they feed only on plants. Their diet varies with the season. In summer their main food is the leaves of green plants; while in the fall they may eat acorns; in the winter they eat primarily buds and twigs. A deer eats six to eight pounds daily of plant material. In the winter, they may get as little as two or three pounds and still survive. A deer has a total of 4 stomachs, allowing it to get more nutrition from the food it eats. The deer is a ruminant mammal. A ruminant feeds on plant material and then stores the food in its first stomach (known as a rumen). Then later when it laying down in a safe area, it “burps up” the food and re-chews it. This is a called “chewing the cud”. Many mammals ruminants including cows and goats. Chewing cud allows an animal to get more nutrition out of its food. Deer have excellent eyesight and can detect the slightest movement. Even the blinking of an eye can cause a deer to “bolt”. However, deer are color blind. So if you are hunting and wearing “blaze orange” for hunter safety, deer will not be afraid of the color. Their hearing is excellent and their ears can move, allowing them to pick up sounds of possible danger. Possibly their strongest sense is their ability to smell a scent from a distance of over 1/3 of a mile. This was one of the most interesting articles I have found! Thank you! I read an article in American Hunter magazine that says deer actually see in blues and greens. Great article love reading more about the animals thank you. It is July 3 2017 and I am sitting on my front porch in North Georgia watching 5 bucks grazing the grass and corn in my yard. They are in varying stages of maturity with one large one dominant. They were here last year as well. We also have a group of six does with a spike that comes throughout the day. Very enjoyable to watch. We are in the Ozarks near Branson, Missouri on Bull Shoals Lake. Fortunately, we are blessed with all kinds of wildlife, fox, bear, bobcat, roadrunners, eagles and many deer. Lately, we have a doe, her twins (same color as Mom) and a differently colored buck! His color is more gray? My question is why is this huge buck sticking around and what’s up with his color? Is he a different breed and can they mix? I am from Clermont County Ohio. I thoroughly enjoyed this article. It is informative and has enlightened me with things that I did not know. I had heard from some that deer are color blind but others have claimed that not to be true. How does one determine that a species is color blind? Anyway, thank you for your article!